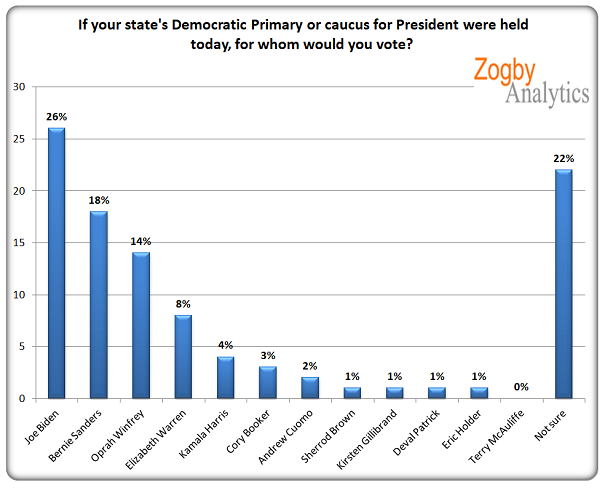 A new poll from Zogby Analytics shows that former Vice President Joe Biden is expanding his lead over Bernie Sanders for a potential Democrat primary in 2020. Biden leads the senator from Vermont by a count of 26-18 percent, with a woman who vowed she wasn’t going to run named Oprah Winfrey coming in third with 14 percent, and another woman who faked Native American heritage to get where she is, Elizabeth Warren, a distant fourth at 8 percent. Rounding out the poll in the Hall of Shame section is Kamala Harris (4%), Cory Booker (3%), Andrew Cuomo (2%), Sherrod Brown (1%), Kirsten Gillibrand (1%), Deval Patrick (1%), Eric Holder (1%), and Terry McCauliffe (1%). Actually, the ever-popular ‘Not Sure’ came in at a rousing 22 percent and could rival Biden should he/she announce. How is Biden doing it? He’s getting stronger polling numbers as the voters’ age goes up. While millennials continue to gravitate towards the socialist curmudgeon in Sanders, those individuals old enough to know what socialism does to a society lean more towards Biden. Biden has said that he’d only consider a presidential run if he could take on Donald Trump. We’d certainly like to see that matchup. Do you think Joe Biden will run against Trump in 2020? Who would win that matchup? Share your thoughts below!